She stretched out her hands to the Lord and said, “O Lord who made and created me, and have kept me from my infancy, … who took from me the love of the world, who have kept my body from pollution, who made me to overcome the executioner’s torments, iron, fire and chains, who gave me the virtue of patience in the midst of torments, I pray Thee to receive my spirit. For it is time, Lord, that Thou command me to leave this world, and come to Thy mercy. Saying this, she sent forth her blessed spirit. The Christian people, taking away her holy body, set it in a new sepulcher, after anointing it. And when she was being laid to rest, there came a young man dressed in silken garments, … and he entered the place where the holy virgin’s body was being laid, and set there a small marble plaque on which it was written, “A holy mind, willing, honor to God, and the liberation of the fatherland.” And he stood there until the sepulcher was diligently closed, and then departing was seen no more in all the province of Sicily; whence there is no doubt that he was and Angel of God. These words were set to music, and commonly sung as the antiphon for the Magnificat at First Vespers of the feast of St Agatha. 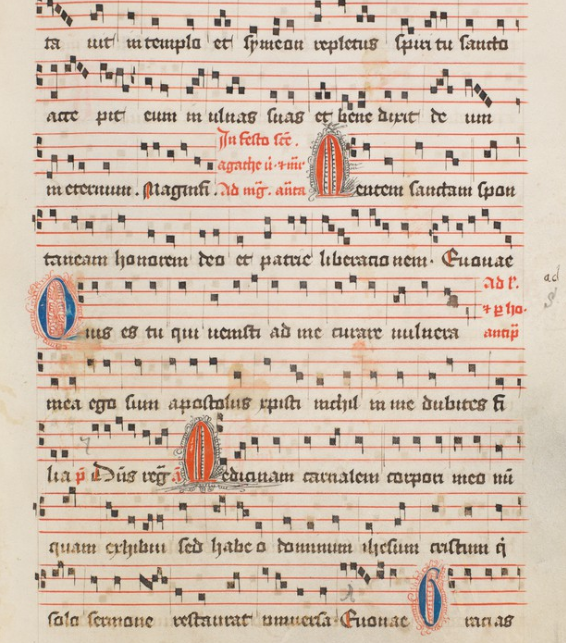 This antiphon was removed from the Roman Breviary in the Tridentine reform, which also no long mentions the plaque or the angel in the Matins lessons; it was retained, however, by the Dominicans and Cistercians. 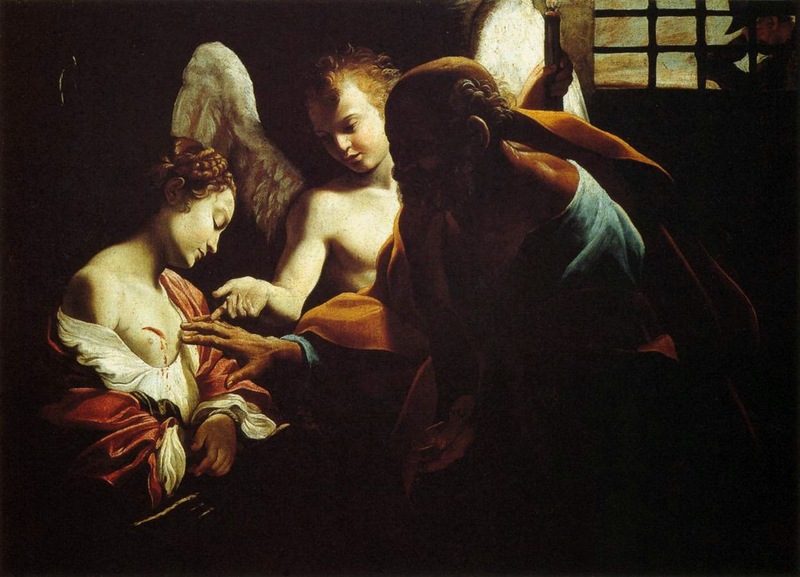 The motive may have been that the story itself was thought to be unlikely, and it is certainly true that the acts of St Agatha are not considered to be historically reliable; or it may have been simply because it is a grammatical fragment. This story was also known to the composer of her liturgical texts in the Byzantine Rite, in which the following hymn is sung at Vespers of her feast. 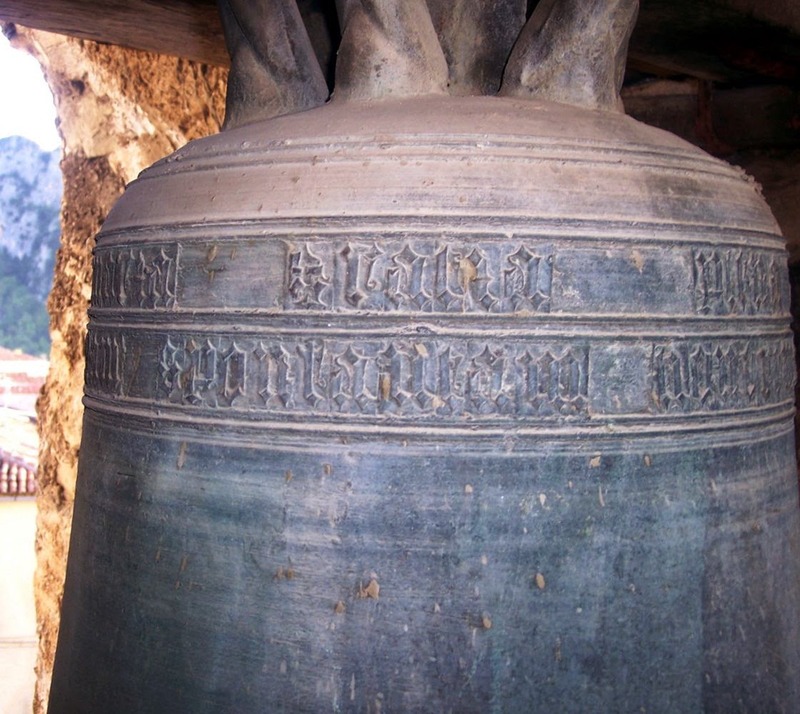 The inscription of St Agatha on a bell in the Italian city of Laurino. This may derive from the tradition that St Agatha repeatedly delivered the city of Catania where she was martyred from the dangers posed by the eruption of Mt Etna, a fact to which the Golden Legend also refers. When a year had passed, around the day of (Agatha’s) birth into heaven, a very great mountain near the city burst and belched forth a fire, which coming down from the mountain like a flood, and turning both stones and earth to liquid, was coming toward the city with a great rush. Then the multitude of pagans went down from the mountain and felling to her sepulcher, took the veil with which it was covered, a set it against the fire; and immediately on the day of the virgin’s birth, the fire stood and proceeded no further. This story appears in the Office of St Agatha in the antiphon of the Benedictus. The multitude of pagans, fleeing to the to the virgin’s grave, and took her veil against the fire; that the Lord might prove that he delivered them from the dangers of the fire by the merits of the blessed Agatha, His Martyr. St Agatha’s veil drives the fires of Mt Etna away from Catania, by Cesare Nebbia and Girolamo Muziano, 1580-83; from the Hall of the Maps in the Vatican Museums. 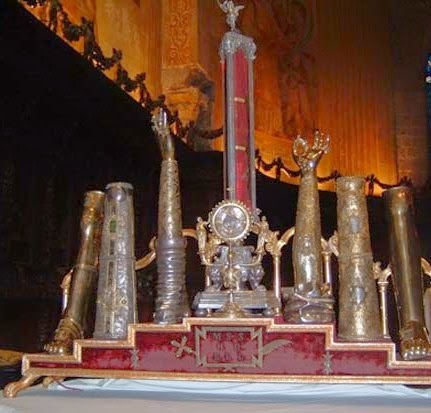 Relics displayed in the Cathedral of Catania on the feast of St Agatha, including her veil, the red piece of cloth in the tallest reliquary in the middle. It is still frequently carried in processions in the city an environs. A 13th-century reliquary of the Saint, crusted over with jewels that have been donated to her over the centuries. In her left hand she holds a plaque with the famous inscription on it.